Vanessa Grasse, Bettina Neuhaus and Phill Harding are excited to be in residence at Yorkshire Sculpture Park from 29 May – 6 June 2013, as the starting point of their research focuses on site-responsiveness and our relationship with an environment. This is the first time the three artists have collaborated; they will start the initial stage of their research at Yorkshire Sculpture Park to explore the possibilities of this cross-artform collaboration. Vanessa will explore and draw ideas from her two latest walking projects: Routes commissioned by Dance4 and Momentary Distractions commissioned by University of Leeds and Yorkshire Dance. Being in residence at Yorkshire Sculpture Park will help her to further develop this work.Bettina has directed several site-specific performances for professional and non-professional dancers. Phill has a history in sound-walks and his current work involves the use of environmental field recordings. Yorkshire Sculpture Park will provide an ideal environment for the cross-fertilization of ideas between the three artists. During the residency the artists will work in parallel, departing from a set of shared site-responsive questions. They will use both outdoor- and indoor-based practice. Through shared practice their findings will be collaboratively processed and inform the next stages of the work. • Investigating a walking practice as a way to explore specific physical and perceptual states in relation to the landscape. • Looking at everyday choreography in a rural space and how we inhabit ‘space’ and ‘place’. • How can the practice of iteration and attentive listening inspire and generate distinct materials of different media (e.g. movement, video, photography, sonic material, etc.) as a response? This residency will culminate in a public sharing of work-in-progress. 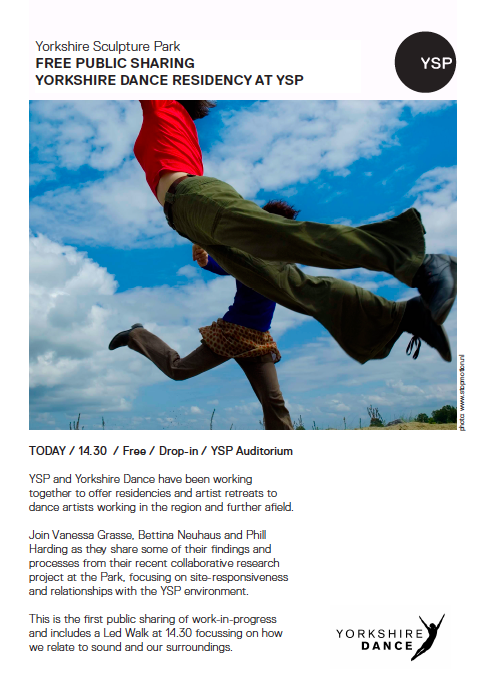 Vanessa, Bettina and Phill will continue their research in residence at Yorkshire Dance in Leeds from 6 – 18 June.